Open University S260 Thin Rock Sections. Selected Image Gallery. 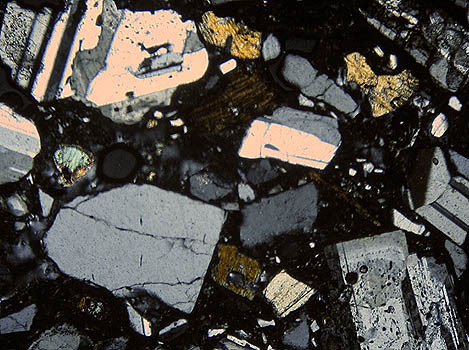 'Studying the OU S260 Thin Rock Sections Under The Microscope'. 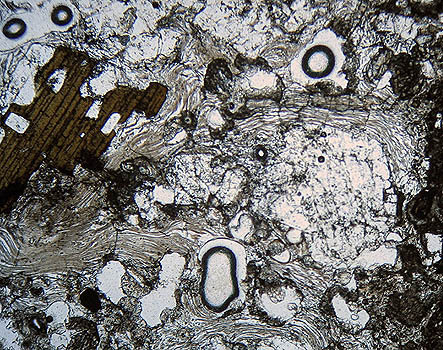 I had a little time left after completing my article on the Open University S260 thin rock section slides before the February issue was due on Micscape. So to follow up on this, I have included a few more images taken with the Leica CME microscope and Canon Ixus 400 digital camera, all the images were taken at 40x optical magnification. The lefthand images all use plane polarised light and the right images, crossed-polars. It was not my intention to list all the minerals that can be seen but to give a few details and an overview to some of the remaining slides of the OU S260 set. The article is best viewed in a screen resolution of 1024x768 pixels or higher. Terms in italics can be cross-referenced to the main article. 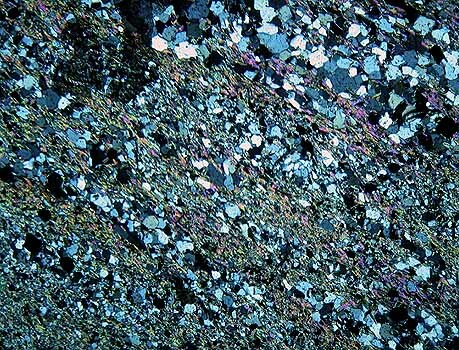 Back to the main article: 'Studying the OU S260 Thin Rock Sections Under The Microscope'. Selected slides for the image gallery. 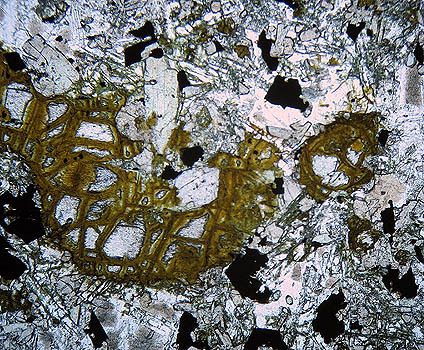 Slide [C], Peridotite from Italy. General: Peridotite is an igneous rock comprising mostly olivine, pyroxene and hornblende. Chromite [a source of chromium] is often associated with peridotite. 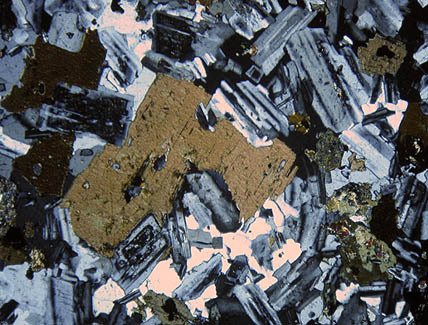 Slide [D], Diorite from Italy. General: Diorite is an igneous rock. 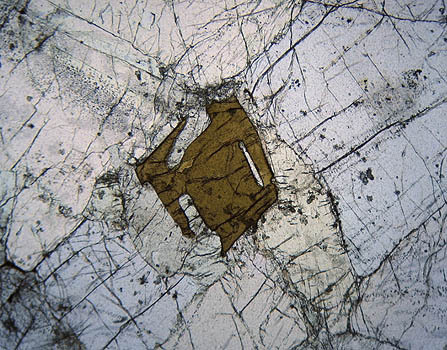 This sample: the left and right images are from different parts of the slide, in the crossed-polar image a central crystal thought to be biotite can be seen surrounded by feldspar showing various degrees of twinning. 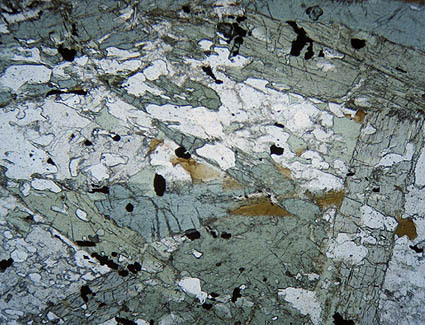 Slide [G], Dolerite from Clee Hill. General: Dolerite is an igneous rock and is one of the varieties of basalt and coarse grained in texture. 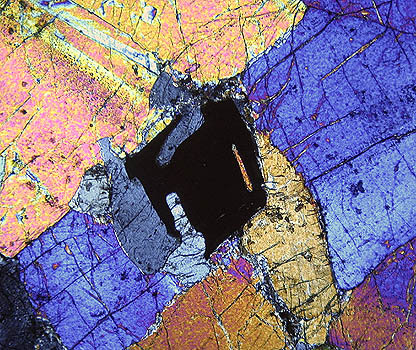 This sample: The two images are from the same part of the slide, the large crystal is thought to be clinopyroxene and most of the smaller crystals, feldspar. 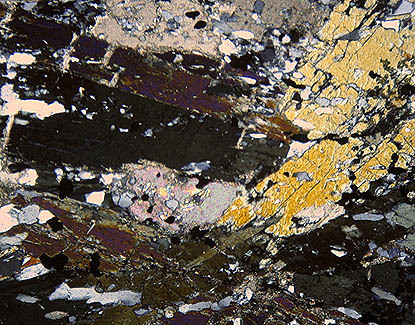 Slide [N], Amphibolite from Donegal, Ireland. General: Amphibolite is a metamorphic rock and varies in grain size from coarse to fine, comprising mostly hornblende and plagioclase with smaller quantities of other minerals depending on location. Slide [P], Phyllite from Loch Leven, Scotland. General: Phyllite [Greek: 'leaf'] is a metamorphic rock, laminated in structure, the major constituents include sericite - a form of mica and quartz with smaller amounts of several minerals including biotite and feldspar. 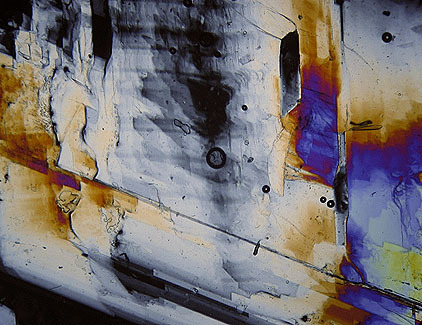 This slide: larger quartz crystals can be seen within the laminated structure together with much smaller unidentified crystals with higher [pink] interference colours. 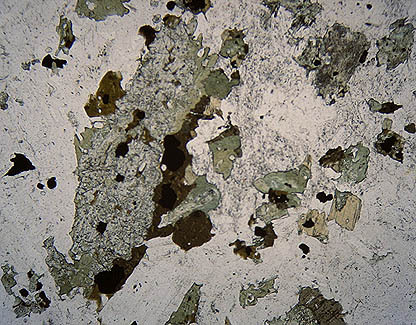 If you look at the phyllite slide [P] at the top of the article you can clearly see a definite 'banding' or laminated structure through the thin section. 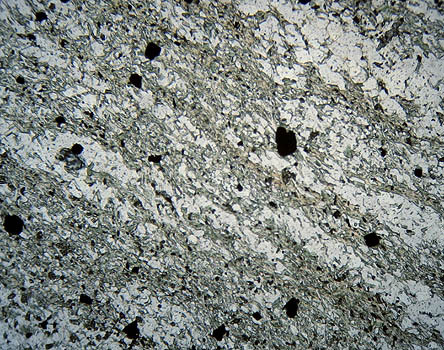 Slide [V], Ignimbrite from Italy. General: Ignimbrite is an igneous rock [Latin: 'fire cloud'] these rocks start off as hot fragments thrown out of volcanoes, reaching the ground still in a molten state, they build up and fuse together to create a compact rock also known as pyroclastic rock. Ignimbrite may contain glass, quartz and feldspars. 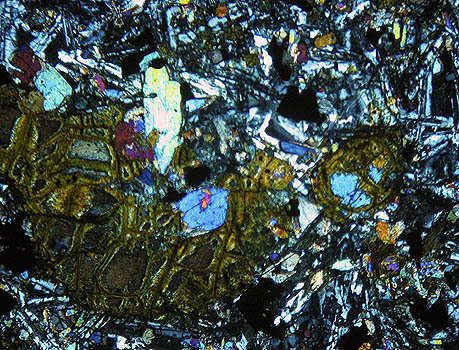 This slide: the plane polarised light image shows quite a complex structure whilst the crossed-polar image from a different section of the slide shows some of the feldspar associated with this rock. General: Gypsum is a mineral and appears colourless in thin sections, it is the chief constituent of gypsum rock. 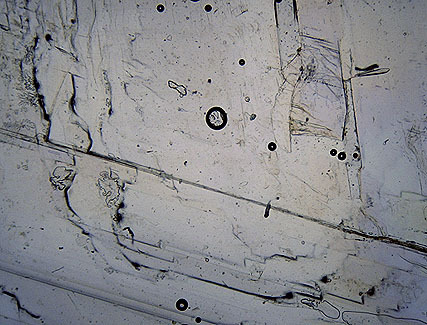 Gypsum when accurately cut to the required thickness was commonly used with polarizing microscopes as a 'sensitive tint' plates or 1st order red plates which could be inserted into the light path of a microscope using crossed-polars. This slide: Under plane polarised light you can clearly see one of the cleavage planes and from the crossed-polar image some of the interference colours. Gypsum has a low birefringence value of 0.009 and would normally show only weak interference colours of the 1st order similar to quartz in thin section, but this section is much thicker in parts and showing stronger interference colours. Comments to the author, Ian Walker, are welcomed. � Microscopy UK or their contributors. Published in the February 2004 edition of Micscape. � Onview.net Ltd, Microscopy-UK, and all contributors 1995 onwards. All rights reserved. Main site is at www.microscopy-uk.org.uk with full mirror at www.microscopy-uk.net.